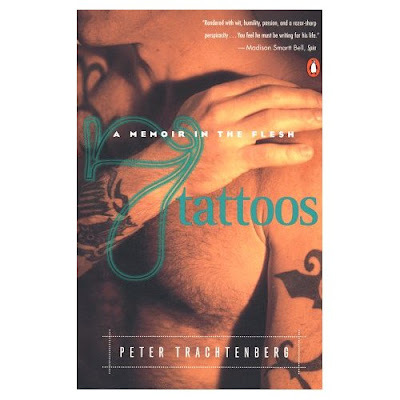 First and foremost, let me clear something up: 7 Tattoos by Peter Trachtenberg is a memoir and is not a book about tattoos. Oh, there are tattoos within, and stories about them and how they were obtained. 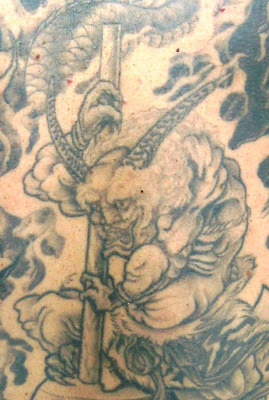 But tattoos help form the context of the story within, and the ink is often secondary to the action at hand. 7 Tattoos is a riveting narrative, "a memoir in the flesh," about the author's inner struggles with his identity and the world around him. His tattoos form the structure of the book, serving as chapters around which Trachtenberg's life revolves. Imagine a first tattoo: assuming that it wasn't inked on the fly, everyone's first tattoo comes with context. On Tattoosday, I try and tell the story behind the tattoo. But even I know that I am only scratching the surface of the narrative skin. Each of the author's seven tattoos serves as a focal point out of which a life chapter spins. From a tribal piece that is inspired by the ink of Southeast Asia (and subsequent trips there) to tattoos that mark chapters in a life punctuated by drug addiction and strained parental relationships, we are given a warts-and-all tour of Trachtenberg's life. As important as the tattoos may seem, they are really just sign-posts with memories in the ink. Ultimately, 7 Tattoos is about relationships - Trachtenberg's relationships with women, his father, his mother and, ultimately, himself. "The tattoo Slam had given me was a drawing of a wrench placed diagonally between two gears. She'd rendered the spinner with punctilious thoroughness, down to the highlights on the chrome-plated shaft, while leaving the gears black silhouettes, and she'd unified the composition by framing wrench and gears with a red triangle that sat athwart my deltoid." This passage describes the tattoo with political undertones, in a chapter entitled "I Keep the Red Flag Flying". He does a remarkable job taking a 1992 tattoo and narrating back twenty years earlier to 1972. Again, the tattoo anchors the chapter and is the glue that holds it together. Trachtenberg has skillfully built a personal history around seven works of art. It doesn't matter where they were inked or if any of them are "good" or not. Each piece is a jumping-off point that elevates the memoir above the standard personal history. 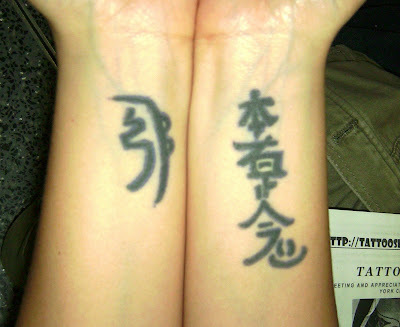 7 Tattoos was recommended to me last Spring when I was interviewing poets and writers for my Tattooed Poets Project. I wish I could remember who suggested I read it, because I would love to thank them. The tattoos in the book are not at center stage, yet they manage to grab a hold of the imagination throughout as we are carried along by the story of Trachtenberg's life. It's an experience I would heartily recommend to anyone interested in good writing, with a penchant for ink. 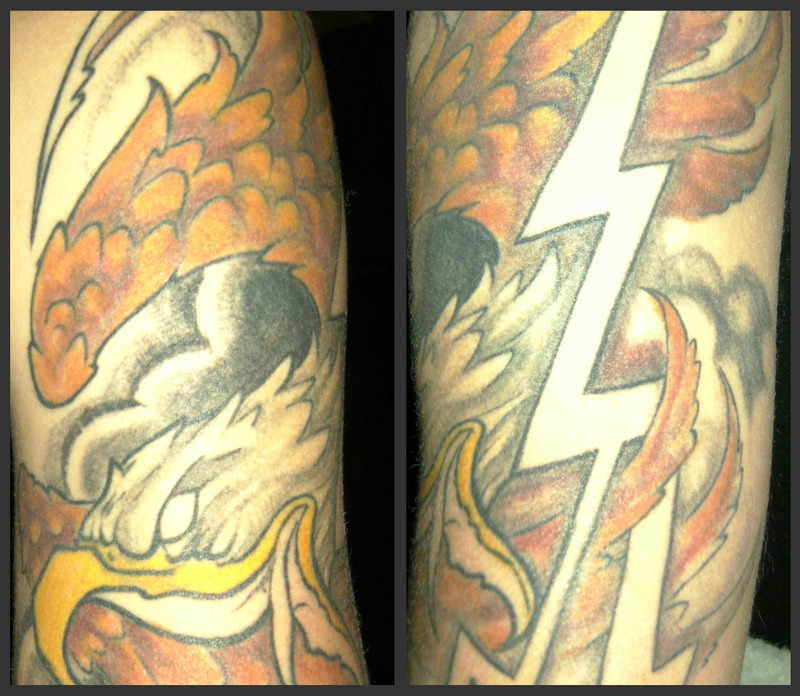 This depiction of an eagle flying through a storm belongs to Cody, who was in town visiting from Key West, Florida. This symbol of strength and courage enduring the dangers of a powerful storm is fitting, as Cody began work on the piece as a tribute to his father, serving in the Armed Forces in Afghanistan. Cody has already had three sittings for this wonderful tattoo, and is close to finishing it with "Tattoo" Mike Haugh at Key West Tattoo Company. Thanks to Cody for sharing this great tattoo! We look forward to seeing the final product! There are many things to be thankful for on Thanksgiving. I know that may cliché , but at its core, there is the kernel of truth. All it takes to remember this is to cross paths with someone who has overcome the odds to prevail in life. 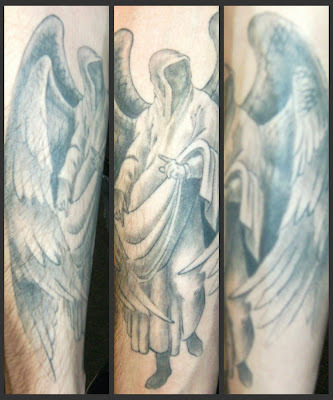 Inked on his inner left forearm, this angelic image is a product of an idea of a spirit watching over him, He gathered a couple of photos for reference and presented them, along with a short written paragraph about the concept, to a tattoo artist at Fat Ram's Pumpkin Tattoo in Jamaica Plains, Massachusetts. It was the tattooer who gave Tay the writing assignment. I am impressed that the artist would incorporate that into his creative process, and it makes perfect sense. Although Tay is not religious, per se, he wanted something spiritual to remind him of his guardian angel that helped him overcome the mortal challenge of cancer. As it turns out, Tay is a survivor, who has been cancer-free for ten years after a victory over acute lymphoblastic leukemia. Tay notes that, all it takes is a look down at his arm to remind him that he has come a long way from the lows of facing one's mortality at such an early age. I want to thank Tay for sharing his tattoo with us here. And I wish a Happy Thanksgiving to all the Tattoosday readers! Back on July 13, I posted a photo of Doug's Geisha. Doug was waiting around the Penn Station area before heading down to see Horisei, at tattoo artist working out of Rising Dragon's Chelsea Tattoo Company. Work from Horisei has appeared previously on this site here. 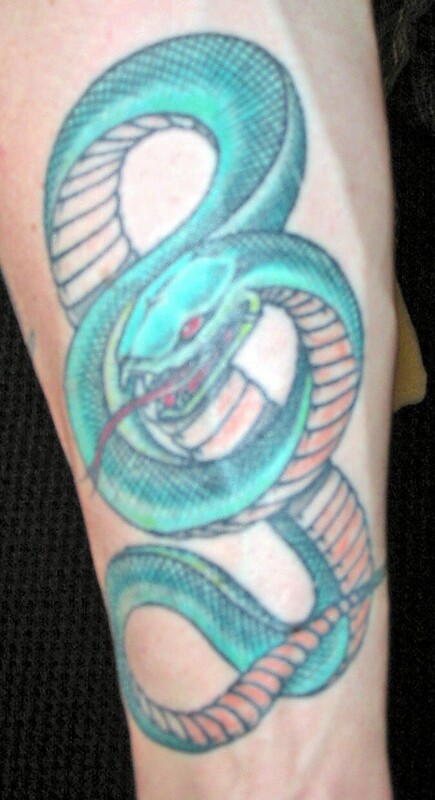 Thanks again to Doug for sharing his new tattoo work with us here on Tattoosday! 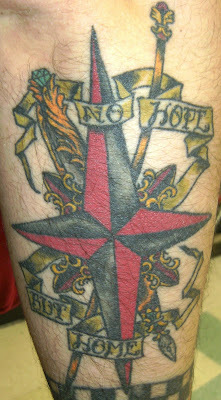 Back in May, I met a guy named Mike outside of Penn Station and he shared this tattoo with us. Occasionally, contributors who I have met on the street will send me a follow-up of additional tattoos that I didn't photograph the first time I met them. Mike was generous enough with his time and energy to do just that. 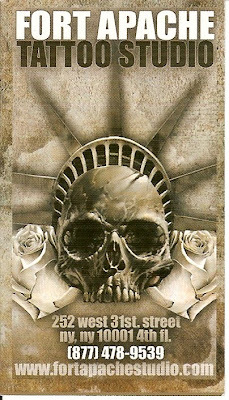 This, like the previous work featured from Mike, was inked by Doug White at the Ink Spot in Linden, New Jersey. I love the cross-hatch patterns on the back of the snake. The lines are so finely drawn, I am impressed by the amount of patience it must have taken to get these tiny details just right. These last two pieces were inked at Tattoo Lou's in Babylon, New York back in 2000. Work from Tattoo Lou's has appeared previously on Tattoosday here. 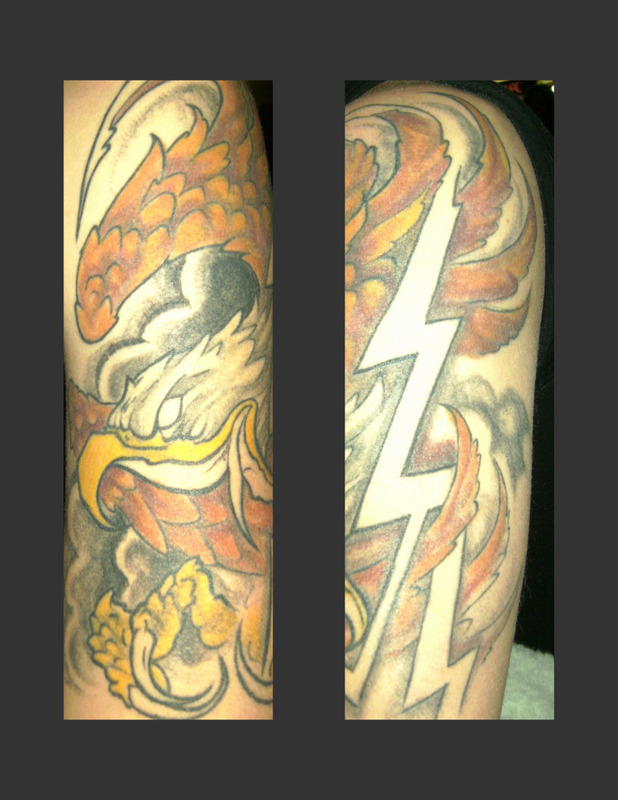 Thanks again to Mike for sharing more of his ink with us here on Tattoosday! I will pace subway platforms, while waiting for my train, so that I may exercise a bit, and, let's face it, spot the occasional tattoo. After meeting TG on the 59th Street platform in Brooklyn, and talking tattoo with him all the way to 95th Street, he told me I was lucky he had removed his sweater back on 59th. That is a brontosaurus, which is on his left arm. It was an impulse decision and serves solely as a decorative reminder of a moment in time. TG had just left work with a paycheck and wandered into Rising Dragon Tattoos in their (relatively) new 14th Street location. The artist was Davide, who hails from Italy, and was most likely a guest tattooer at the time. TG sings his praises as he took a relatively simple design and gave it his all, down to the shading of the dinosaur's eyes and toe nails. 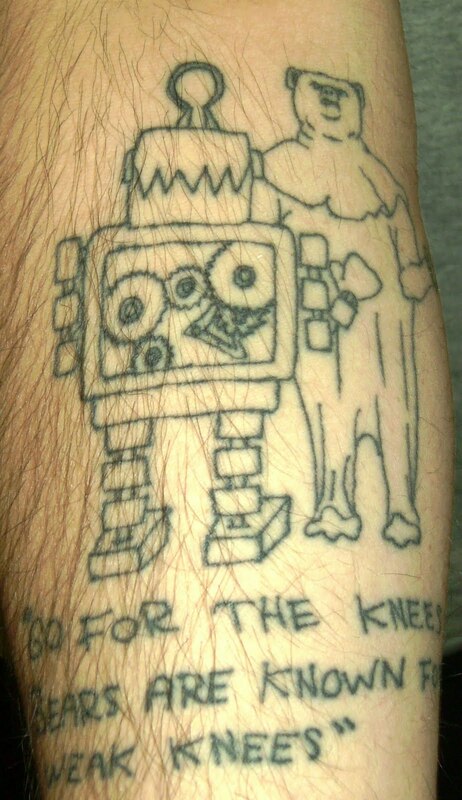 The caption under the robot and the bear reads "Go for the knees! Bears are known for weak knees!" This refers to a brief snippet of dialogue in Season 1, Episode 3 ("Blind Date") of the NBC sitcom 30 Rock. 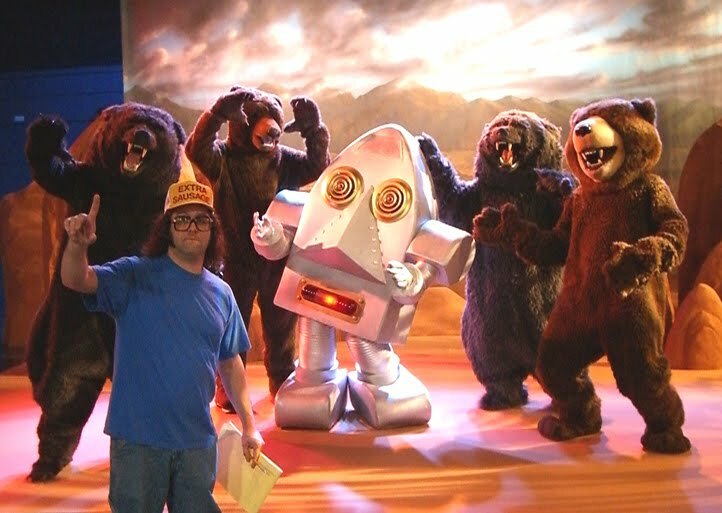 The line is uttered by the character Frank, who is played by actor/comedian Judah Friedlander. 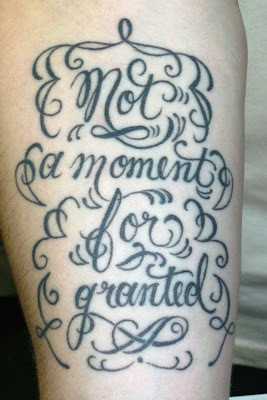 The absurdity of the line made it memorable to TG, who chose to immortalize it on his right forearm. The tattoo was inked by Mike at Mad Pup's Tattooing in Plattsburgh, New York. Thanks to TG for sharing his two eclectic tattoos with us here on Tattoosday! First, a point of clarification. I write blog posts with the ideal blog reader in mind. The ideal blog reader being me. And what I have noticed over the years is, despite the interest in the subject matter, it is rare that a blog post will hold my attention longer than a few paragraphs. This is why Tattoosday posts are generally brief, not drawn out, and some times split into multiple parts. Similarly, my attempts at literary criticism are not as in-depth as many may like. I acknowledge that shortcoming while noting, for many, this is actually a plus. That said, I am long overdue in reviewing Tattoo Machine: Tall Tales, True Stories, and My Life in Ink by Jeff Johnson. 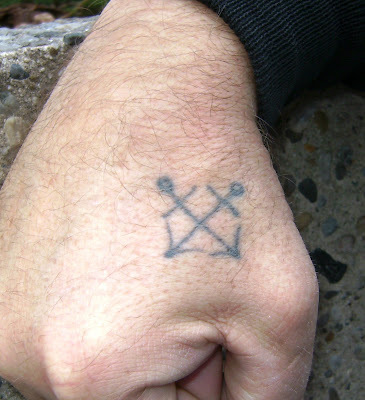 Johnson is a tattoo artist and owner of the Sea Tramp Tattoo Company in Portland, Oregon. As anyone in America can tell you, the rise in popularity of the art of tattooing has skyrocketed in the last twenty years, and the first decade of the 21st century has seen the acceptance of body art increase exponentially. Johnson's book is not your typical tattoo primer (the fanciest of which has been Kat Von D's immensely successful High Voltage), but rather, a memoir of his life and experiences as a tattoo artist. What separates Johnson from other tattoo writers is that he has a true gift for prose, a writing skill that eclipses the efforts of your standard "all about tattooing" books. As a result, the reader is sitting there in the shop with Jeff, listening to his story. I could hear the buzzing of machines and taste the neon in the air. "This isn't simply a memoir. It is also a personal look at the people behind an art form that has undergone a rebirth and is shaking the natal mucus from its drying wings as a new pool of exciting, schooled, and committed artists take their places. This is also a book about street shops and the artists that flourished or inexcusably withered in those fertile grounds. I want to give the reader a more complete picture of a tattoo artist's life and the lessons learned along the way, the things a TV show or a visit to your local establishment can't capture, the things people wonder about when they look through the window the first time and ask themselves What's really going on in there? This is what I've seen. You might not want to get a tattoo from me after reading this, but there you go..."
The narrative wends its way through Johnson's past to his present, getting the reader to appreciate the journey that led the author to the helm of the Sea Tramp. He tells it like it is, warts and all. On shows like L.A. 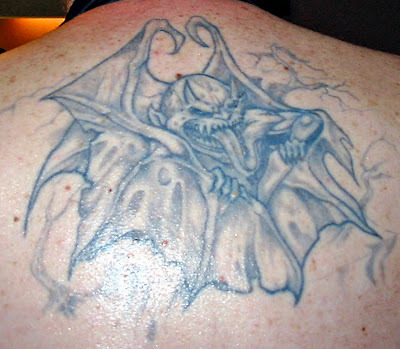 Ink, you don't get to see the unsavory characters that are often hindrances to a tattoo business. We get that here. Part One, Dial Tone, dwells on the business side of tattooing, from employees and scheduling, to flash art and drawing, signs of a good shop, and shop lingo. Part Two, Man's Ruin, provides a primer on the big problems confronting the business: drugs, criminals, scams and oddities. The oddities section certainly opened my eyes and made me realize any good artist wouldn't bat an eye lash over a mild case of psoriasis. Part Three, Love and Hate, talks about the emotional journey that the author has taken. Part Four, Wine, Song and Your Mama, deals with success. Part Five, Tiny Revolutions, revisits the technical aspects of tattooing and spends a nice amount of time discussing the politics of tattooing and the regulation of the industry. And the final section, Part 6, Smile Now, Cry Later discusses pranks, rivalries, and the life cycles of a couple of shops. Johnson does a nice job addressing that aching question: how does an artist feel when a great tattoo dies along with its host. Ultimately, Tattoo Machine, despite its meandering, is a thoughtful, humorous and well-written volume on the life of a tattoo artist. Is it every tattooer's experience? Probably not. But I'd be surprised to find an artist who would read this book and not relate to anything between the covers. We here at Tattoosday give Jeff Johnson's memoir a big thumbs up and a hearty recommendation. Here's some more on Tattoo Machine. I met Shom very briefly as he was about to board a train at Penn Station. This piece represents one of the many chakra for meditation. It was inked at Jinx Proof Tattoo in Washington, D.C. Work from that shop has appeared previously here. Shom had to board his train before I could get more information, but I express sincere thanks for his brief participation here on Tattoosday! It's a cool design that he saw in an encyclopedia and took to an artist at State of the Art Tattooing in Southampton, New Jersey. Drew ascribed his own meanings to the piece, creating his own interpretation of the designs. The main circles he regards as two pinwheels, spinning in different directions. These two, as a whole, represent progression, as life moves forward. Also, along the edges, in addition to some traditional design aspects, Drew pointed out two half-circles and four quarter-circles. These fragmented wholes represent the realms of dreams and realities. By ascribing his own meaning and understanding of the tattoo and its elements, Drew makes the impersonal design (out of a book) more personal and special. Thanks to Drew for sharing his tattoo with us here on Tattoosday! I recognized that they were kanji, but I didn't know that they were reiki symbols. Once in a while I check in with old Tattoosday contributors and I recently revisited Sal, who works at a video store (Mr. Video III) in Brooklyn Heights. You may recall his Guns 'N Roses tattoo (here). 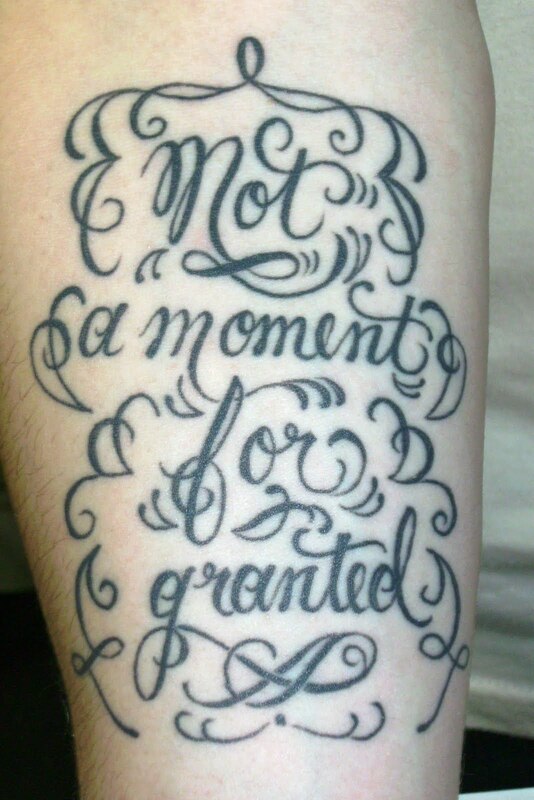 The phrase "not a moment for granted" is inked in tribute to his late acting teacher Fred Kareman, who inspired and taught Sal, not to mention countless others. Sal explained that Kareman instructed in the Meisner Technique, which he described as an "in the moment" method. This phrase can be further applied to life, in general, reminding Sal and anyone who sees the tattoo that every moment is precious, and should be savored like a treasure. 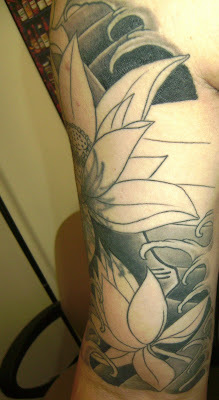 The design and tattooing was done by the incomparable Mark Harada at East Side Ink. 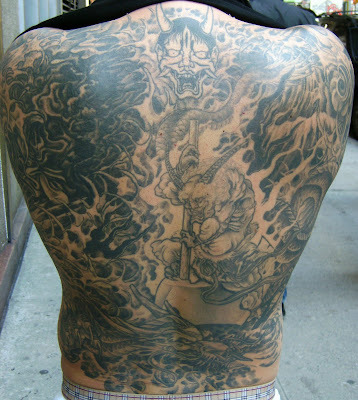 You can see other pieces by Harada featured here on Tattoosday. 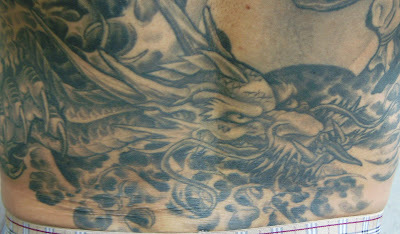 Similarly, clicking the East Side Ink tag reveals other fine work done at the shop. Thanks to Sal for once again sharing a part of his body's canvas with us here on Tattoosday! Back in August, I met Camila in Penn Station after spotting an amazing tattoo wrapping around her lower left calf. The piece was still in progress, however, so we posted this tattoo instead. Camila's tattoo celebrates her Brazilian heritage. The woman is holding two guns and represents female empowerment. The cityscape behind is a Brazilian favela, or tenement, representing her homeland, in addition to the Christ the Redeemer statue, perched high above Rio de Janeiro. It's completely black and gray, save for the red in the lips of the woman and the lone kite flying above the favela. The red represents the colors of the carioca, or the greater metropolitan area of Rio. Truly a marvelous tribute to one's homeland and culture! The tattoo was done by Camila's friend Daniel. Thanks to Camila for sending me the updated photos! As tattooing has skyrocketed in popularity, the number of ink-related books hitting the shelves has multiplied like rabbits. I picked up a copy of Kat Von D.'s book at Borders the other day (read my review here) and was astonished to see it was in its eighth printing. A fresh tattoo-related title emerged earlier this year, and it wasn't in the Health/Beauty/Appearance category, as you would expect. Rather, it's jumping out in the Mystery category. 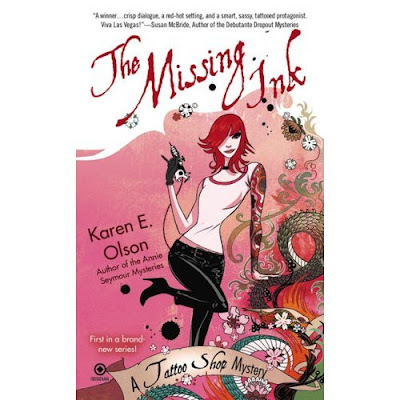 Karen E. Olson released The Missing Ink, introducing a new protagonist to the literary world. Brett Kavanaugh is a Las Vegas-based tattoo artist who gets caught up in a murder mystery. Behold: a new series is born. Ms. Olson is currently at work on book three in the series. 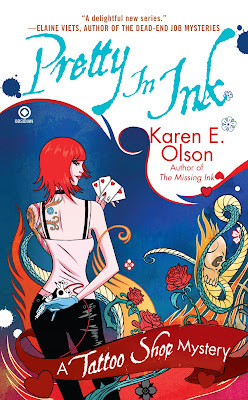 The second title, Pretty in Ink, is due out in March. All judging of books by their covers jokes aside, don't let the art gracing The Missing Ink fool you: this is not "chick lit". Brett Kavanaugh is not looking for love, Manolo Blahniks, or the man of her dreams. She's a career-driven tattooist committed to her art and running her business respectably, as much as can be expected in a Vegas casino. I'm not saying it doesn't have a feminine touch, Brett is still a beautiful woman, with a soft spot for nice clothing and a blazing crush on one of the mysterious characters in the narrative, but she also wolfs down In-N-Out burgers and doesn't back down from her role in a profession that has been traditionally male-dominated. There are notable exceptions to this, of course, but it has only been in the last ten years that we have seen the elevation of the female tattoo artist joining the ranks of their male peers as acknowledged masters of the art form. What The Missing Ink has is a plot that keeps us interested, with characters that are believable and entertaining. Her hefty sidekick, Joel, and diminutive employee, Bitsy, are just two of my favorite characters who are a pleasure to behold on the page. The story wends its way through a maze of a murder that links Brett by virtue of a tattoo she designed but never inked. We get a taste of Vegas that takes us behind the scenes at a casino and even brings us to a wonderfully evocative setting of an Elvis karaoke bar. I can see tattoo purists rolling their eyes at this book because it is a whimsical murder mystery that doesn't necessarily put the art at the forefront of the action. But it's not intended to. Ink is discussed and we often see Bret at work, but the plot often pulls her away from the job. But this, after all, is fiction: a creation of the author that has been carefully researched and presented respectfully in regard to the tattoo industry. 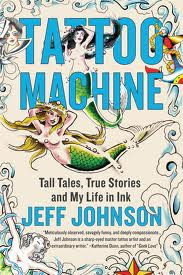 For more realism, I'd recommend Jeff Johnson's Tattoo Machine: Tall Tales, True Stories, and My Life in Ink , which also came out this summer (a review is forthcoming). It's fun to dive into a murder mystery every so often and even more fun to do so when you're interested in ink and the main character is an artist. It's refreshing to read a work of fiction that is centered around the modern tattoo industry and just doesn't use tattoos as clues or signifiers on a character's body. Ms. Olson has created a character that is believable and entertaining. Although I am unlikely to fly off to Vegas and seek out a tattoo at the hotel, I certainly look forward to the Spring when Bret Kavanaugh returns to further grace us with her presence! Here's another review, and another, if you'd like some more opinions. I met Derek Ostrander earlier this week outside of Macy*s flagship store on 34th Street. Derek is an illustrator who also works on visual installations for the department store. Derek explained that he was 19 or 20 when his friend Jay Ferrara, who is also an illustrator, inked this on a kitchen table. The tattoo in question is based primarily on those that are sported by the Arashikage clan of ninjas and, more famously, a character named Snake Eyes, from G.I. Joe. At the age that he got this, he thought it was particularly cool. The image of the condition before transition. So that each finds its place. A fuller explanation, from which this was excerpted, is here. 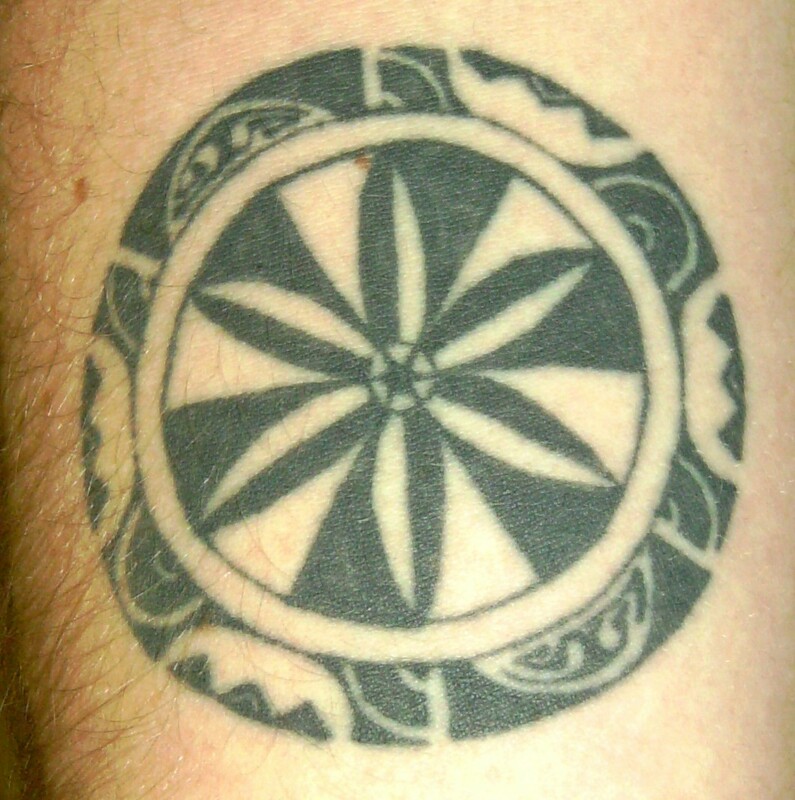 Earlier this year I posted another I Ching tattoo here. Thanks to Derek for sharing this tattoo with us here on Tattoosday! 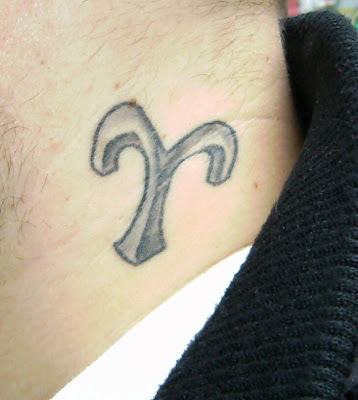 This is a symbol for the astrological sign Aries. 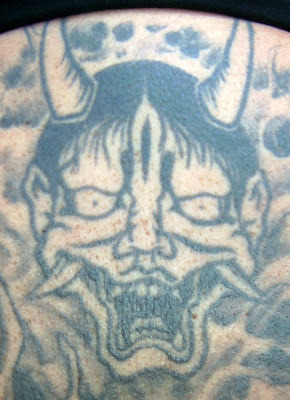 Check out another Aries tattoo on the blog here. He had this done at Tattoo Nation in the Willowbrook Mall in Wayne, New Jersey. Stay tuned, he may be sending us more ink in the future. He has six tattoos in all. Thanks to Stephen for sharing his tattoo with us here on Tattoosday! The banner "No Hope but Home" refers to lyrics from a song by a New Jersey band called Scream Hello. 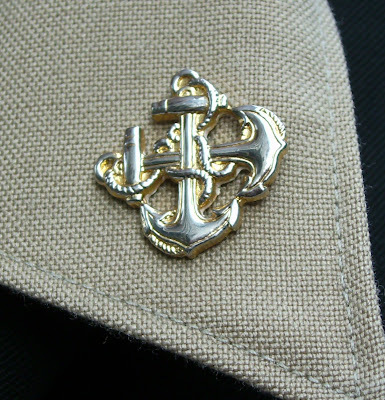 The nautical star, traditionally worn by sailors to serve as a talisman to find a way home, serves a figurative purpose here, pointing toward, while also emphasizing the hopefulness of home, but also the importance of Matthew's parents in his life. Late last December, we posted about our friend Paul getting some cover-up work done on his upper right arm. Revisit the report here. Horisei tattoos out of the Chelsea Tattoo Company, formerly the home of Rising Dragon. Thanks again to Paul for sharing. I'm guessing we'll see the finished product some time in 2010! I met Daniel last week on Seventh Avenue in the 20's. Daniel was a film student at St. John's University, and this tattoo, cleverly designed with film reels as part of the heart, is a tribute to his love of film. 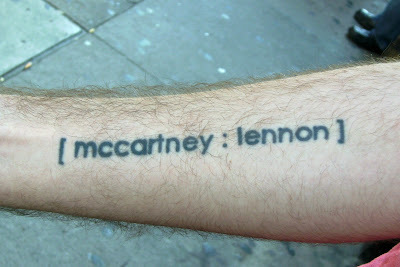 A tribute to The Beatles, this tattoo lets everyone know that Daniel is a fan of the Fab Four. When I asked him why the names were McCartney, then Lennon, as all songs penned by the two are credited as Lennon/McCartney, he just smiled and said, "because I like Paul more". 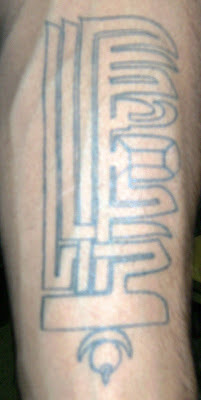 He believes the typeface for this tattoo is Century Gothic. 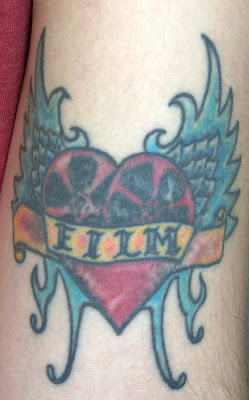 The film heart tattoo was inked by Dan at Addiction Ink on St. Mark's Place in the East Village. Dan's not currently listed on the shop's website, but work from Addiction has appeared on Tattoosday previously here. Thanks to Daniel for sharing his tattoos with us here on Tattoosday! Today is a sad anniversary for us here on Tattoosday, for it marks one year since our friend, Tom Wacker, passed away unexpectedly. Tom was an early supporter of the blog, from its fledgling days as a once-a-week feature over on BillyBlog, and he watched us grow with a mixture of excitement and pride. The camera I use was a birthday gift from Tom and his fiancee Sephora, and he was always first in line to see the pictures I took whenever I had new material for the blog. A week or two before his death, Tom was hanging out at a friend's house in New Jersey. He took pictures of his friend's sleeve and e-mailed them to me. The photos are still in my mailbox, unposted. I still haven't the heart to call his friend and talk tattoo with him. There are times I am hesitant to approach people, for whatever reason, and I overcome whatever resistance I may feel, knowing that's what Tom would have wanted me to do, and that somewhere, he is watching, urging me on, applauding my efforts, admiring the ink. As a tribute to Tom, I am reposting his tattoo, which he shared with us here, back in 2007. It's not the best tattoo, but it's Tom's, and his spirit is infused here in Tattoosday. It's the least I can do for the friend that supported us so much in the early days. Here's to you, Tom! 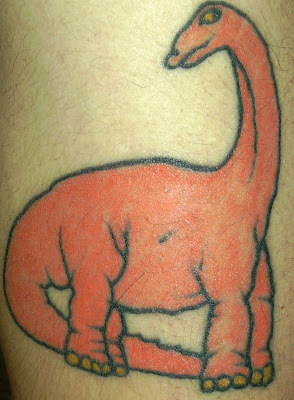 This is the sole tattoo of my friend and co-worker, Tom Wacker. Tom designed and drew the art upon which this tattoo was based. The Reaper is posed on Tom's biceps/deltoid and has resided there since 1984, when its host was a young lad of eighteen. 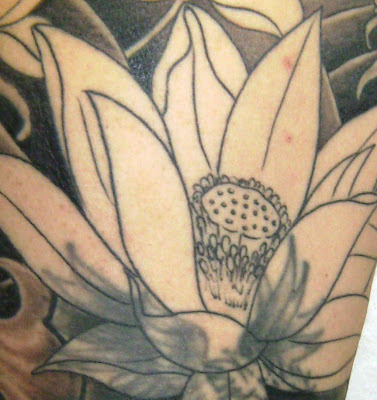 The tattoo was inked by Dean at Lola's Tattoos, then in Cliffside Park, but now in Bogota, New Jersey. Tom got this tattoo "because it was cool," although the tattooer tried to convince him not to get it because it was "too mean" for him. Twenty-three years later, Tom says he has no regrets about his ink. Last month, much to my surprise, our old friend Paul (see his most recent work here) told me there was a tattoo shop nearby. I was surprised, to say the least. "New?" I asked him. "Been open over a year," he replied. I was puzzled. How had I missed a tattoo shop within walking distance of work? Was I blind? Not quite. I was just too busy looking around me, and not looking up. 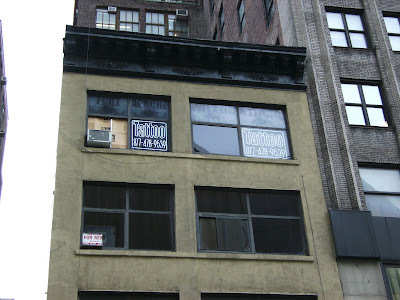 Because Fort Apache Tattoo Studio is just a stone's throw away from my regular inkspotting stomping ground, at West 31st Street near the corner of 8th Avenue. How I missed it was the fact that it peers out over the southwest corner of Madison Square Garden from the 4th floor. Four flights of old-style New York City stairs. But once I made it up there, I was pleasantly surprised by the layout of the shop. Four artists have separate work areas separated by low walls. While there, I met Freak, who specializes in custom designs with a comics influence. Do check out the website to see everyone's work. But another question arose, how had I gone for over a year with this shop in my backyard and never met anyone who had been tattooed there? Of the hundreds of people I have met, no one had shared any work from Fort Apache! The following day I stopped to talk to a guy sitting on a bench at the corner of 7th Avenue and 33rd Street. "And where did you have this done?" I asked. The owner of this tattoo is named eL. He is an artist and a guitarist. The tattoo represents a scar from a bad break-up. Because of the central role of music in eL's life, it only made sense to represent the heartbreak with symbolism near and dear to eL's heart. I asked if the notes actually made up a tune, but they do not. For aesthetic reasons, they are musical symbols inked in flesh, nothing more, nothing less. This tattoo was done by Hexx. 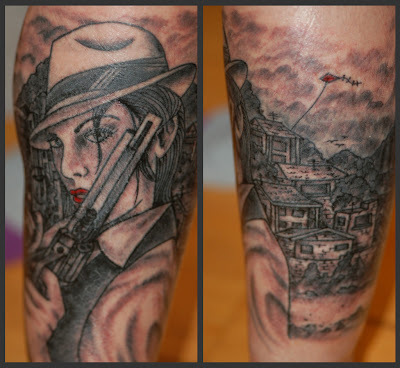 Thanks to eL for sharing this tattoo with us here on Tattoosday! Also a thank you to Freak for welcoming us with open arms as we checked out the shop! Here's hoping we'll see more work from Fort Apache in the future! On occasion, I will wander from 7th Avenue to 8th Avenue, through the campus of F.I.T., hoping to spot some creative work. 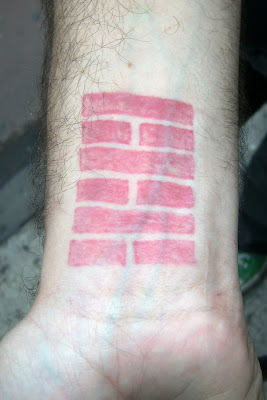 One of my first posts (documented here) featured tattoos from someone I met on that stretch of street. Last month, I ran into Danny, who had several very nice tattoos. This metal-plated heart represents Danny's emotional toughness, with a trace of sensitivity. In his words, "even if my heart is dead, it will still bleed". They read, of course, "HATE PAIN". This just represents what Danny was going through at the time he had his digits inked. I rarely get to feature back pieces, as they have to be offered up by generous contributors, so when I see one, I am seldom disappointed. Thanks again to Danny for sharing so much of his work with us here on Tattoosday!